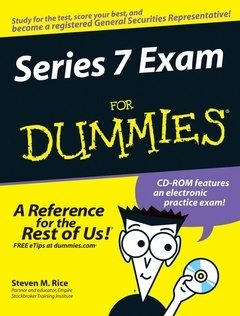 Part I: Gearing Up for the Series 7 Exam. Chapter 1: So You Want to Sell Securities: Introducing the Series 7 Exam. Chapter 2: Preparing for the Series 7 Exam. Chapter 3: Examining Question Types and How to Master Them. Chapter 4: Surviving Test Day. Part II: Mastering Basic Security Investments. Chapter 6: Corporate Ownership: Equity Securities. Chapter 7: Debt Securities: Corporate and U.S. Government Loans. Chapter 8: Municipal Bonds: Local Government Securities. Part III: Delving Deeper: Security Investments with a Twist. Chapter 9: Borrowing Money and Securities: The Long and Short of Margin Accounts. Chapter 10: Delivering Diversification with Packaged Securities. Chapter 11: Working with Direct Participation Programs. Chapter 12: Options: The Right to Buy or Sell at a Fixed Price. Part IV: Playing Nicely: Serving Your Customers and Following the Rules. Chapter 13: Doing a Little Market Research: Portfolio and Securities Analysis. Chapter 14: Going to Market: Orders and Trades. Chapter 15: Making Sure the IRS Gets Its Share. Chapter 16: No Fooling Around: Rules and Regulations. Part V: Putting Your Knowledge to Good Use: A Practice Exam. Chapter 17: Bring It On: Practice Exam Part I. Chapter 18: Answers and Explanations to Practice Exam Part I. Chapter 19: Nothing but Net: Practice Exam Part II. Chapter 20: Answers and Explanations to Practice Exam Part II. Chapter 21: Ten Series 7 Exam Traps to Avoid. Chapter 22: Ten Ways to Start Your Career Off Right.